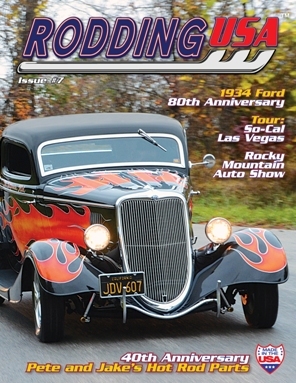 Rodding USA magazine's Issue #7 is sold out. Issue #7 features Pete & Jakes coupes as part of the 40th Anniversary celebrations for Pete & Jakes Hot Rod Parts. These iconic hot rods have been a catalyst for hot rodders worldwide and a solid platform for a thriving and ongoing hot rod component supply business. See behind the doors at Pete & Jakes as we tour their facility and meet the great people who work there. We also celebrate 80 years of the 1934 Ford and look back at the history of one of Fords bumper sales years. Our feature line-up includes the 1929 Ford sedan of Steve & Linda Hart, Bill Davis' 1940 roadster pickup, Brett Schrgiber's 1936 Ford coupe, Charles Nearburg's 1932 Ford roadster and James Spurlock's 1932 Ford sedan delivery. Our event coverage includes the Mooneyes Christmas Show, The Rocky Mountain Auto Show and GoodGuys Southwest Nationals. We also take a look in some very cool hot rod garages and collections including the Open Wheel Museum in Phoenix, AZ. We tour So Cal Las Vegas amazing store and check out their parts clothing and memorabilia. Our Tech series takes a look at fittting a Currie 8" rear to a deuce roadster, a look at licence plate toppers and also at wire wrap. All this plus our regular features, new products, news from around the industry, hot rod artists and the latest list of hot rod shops stocking the magazine..